One of the six Egyptian mummies in the country is decaying. To stop its further degeneration, the Department of Archeology has started a project that will be a case study for such conservation across the world. The mummy — said to be of Egyptian Princess Nishushu — was obtained by sixth Nizam Mir Mehboob Ali Khan in 1920. His son and last Nizam Mir Osman Ali Khan donated it to the museum, where it has been kept since 1930. Initially Princess Nishushu was believed to have died at the age of 16 in the Ptolemic period — 300 BC to 100 BC. But a CT scan – done on very few mummies in the entire world — and X-ray examination revealed she was aged around 25 years. The team also discovered parts of the brain, which were still intact – a great deviation from the process of mummification. It was found during the CT scan that her ribs were damaged and there was a slight dislocation of her spine and one ankle. The rest of her bones, skull and teeth are intact. It is likely that a metallic amulet has been placed inside her body, officials said. 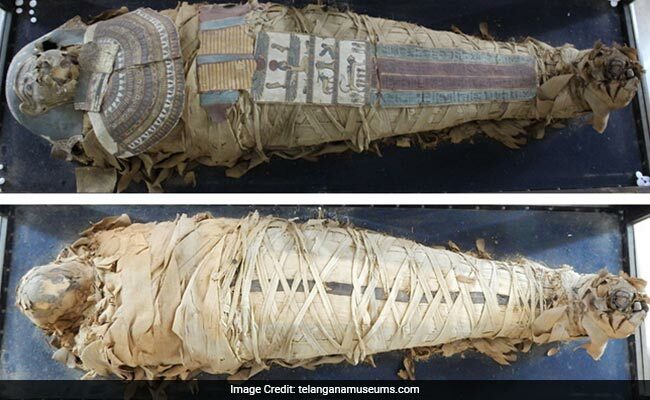 “The damage to the mummy had happened due to heat, light, temperature, humidity, insects and oxygen,” said Vinod Daniel, Heritage Conservation Adviser to the project. The conservation techniques adopted includes changing the case to an oxygen-free one, which will stop infestation of bacteria and insects and keep away humidity. The techniques were used for the preservation project here for the first time. It can set an example for conservation of mummies in India and abroad, officials said. The painted cartonnage — a material used to make the funerary mask — has been replaced in the proper position and the showcase has been sealed again, he said. The next phase of the conservation will involve remedial measures and possible restoration of the cartonnage, so it can then be displayed in a special showcase, Mr Venkatesham said.